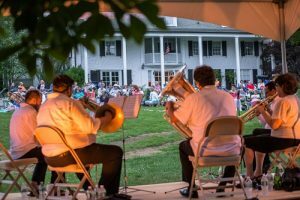 On Friday, August 18 members of the Westchester Philharmonic Brass Quintet brings classical favorites, jazz standards, popular hits and more to the picturesque park as park of the Music in the Park Series supported by the Friends of Lasdon Park, Arboretum and Veterans Memorial. Led by Phil Trumpeter Wayne DuMaine, the event is the perfect musical experience for all ages; concert-goers should plan on lawn seating and bring their own blankets or lawn chairs. Food and beverages, including beer, wine, pretzels and hot dogs will be available for purchase. Gates open at 5 pm. Music is 7 pm. This entry was posted in Press Releases and tagged brass, classical, Jazz, outdoor, philharmonic. Bookmark the permalink.